As with most things in life, I’m a fan of the “all things in moderation” approach — and yes, that even includes screen time for my children. While our kids are still far too young (in my opinion) to have access to a computer, a cell phone, or even their own tablet, they definitley do enjoy watching shows on Netflix or via the Disney Jr and PBS Kids apps, and we all love doing Facetime with out-of-town relatives. Nora also has a reading App her teacher requested we put on the iPad. She does that (or reads actual books) on Sunday afternoons when the other kids are napping. 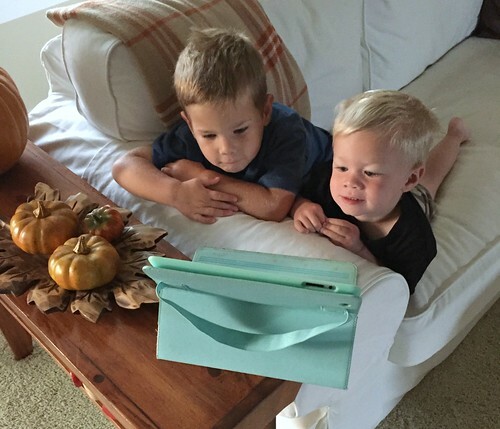 We sometimes use screen time as a babysitter (no shame! ); we sometimes use screen time as an incentive or reward for completing other tasks quickly and without complaining; we sometimes take screen time away as a punishment. 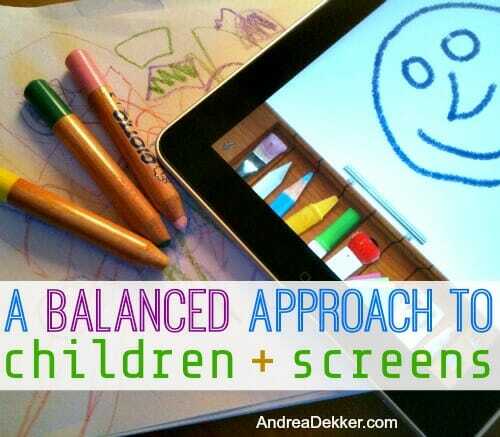 However, most of the time, our children’s screen time is simply part of their daily routine. We usually enjoy a little down time to watch a show during our mid-morning and mid-afternoon snacks, when we need a break from whatever else we were doing. Then after the show is over, we switch gears to something else. 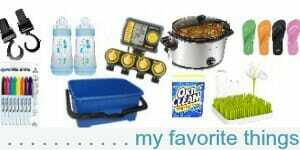 We might get games or puzzles out, do some baking or getting dinner in the oven, color, play with gak, go outside, etc. etc. The TV or iPad is just ONE of the things we do each day — just like eating, getting ready, playing with toys, going to school, running errands, etc. It’s not good or bad — it just IS. Of course, there are lots of people now days who feel the need to express their thoughts about how screen time is corrupting our children’s minds… ironically, these expressed “concerns” are usually from people much older than me, with no children’s minds to worry about! 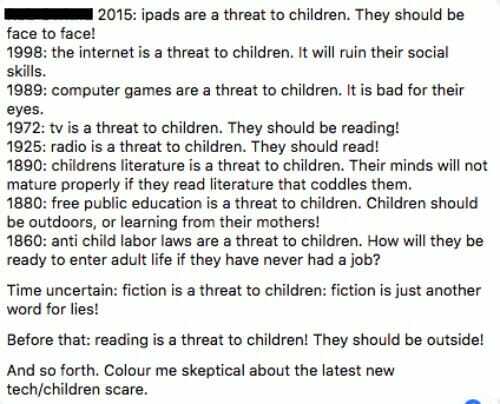 One person I follow on Facebook recently shared an article (along with their strong opinion) about how iPads in particular are “ruining our children’s lives”. I briefly skimmed the article, but what I found more fascinating was this particular comment…. Honestly, I wanted to slow-clap. That comment is EXACTLY how I feel and EXACTLY what I want to say any time anyone makes a comment about children and technology! Yes I think technology needs to be monitored; yes I think parents need to know what their kids are doing online (and set limits when necessary); yes I think there CAN be lots of scary things to worry about online so parents must talk about this with their children. But that’s just part of life in the 21st century. There were lots of things other parents had to worry about in the past that we no longer need to concern ourselves with. Technology and “screens” aren’t going away anytime soon, so we might as well accept that they will be a huge part of our children’s lives, and simply learn to live WITH them and help our children live WITH them. If you share my thought process, OR if you’re looking for more information to help you evaluate the use of screens in your home, I thought the following NPR video clip was quite helpful and extremely SIMPLE! Screens are a wonderful tool we can use to make our lives easier and more enjoyable. 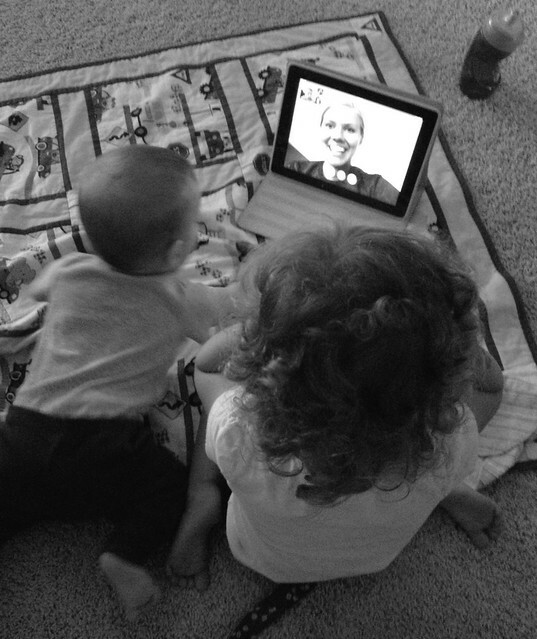 For example, the kids and I often do Facetime with relatives who don’t live close by. We also enjoy taking videos of the kids doing silly things and then watching them back again (we cast them to our TV via ChromeCast). We have a talking gorilla app on the iPad that repeats whatever the kids say back in a silly voice — they think it’s hilarious! There are a lot of fun (and educational) things that can be done with screens — so make sure you and your kids take the time to actually ENJOY them. As with anything, there should be limits — those limits will look different for every family, possibly every child. Since our children are younger, we have so much more control over their screen time, but it’s still good to have a few guidelines in place now that will hopefully help them to limit their own screen time as they get older and become more independent. I mentioned above that we DO use the TV as a “babysitter” — and honestly, I’m totally OK with that (on occasion). There are plenty of other times when we use screens together as a family (like when we watch silly home videos, do Facetime with relatives, or watch movies together). If you have older children, I think it’s a good idea to let them show you what they are doing, what Apps they are using, etc. so you can learn about it and better monitor their usage. Also, keep in mind our children are learning how to use screens FROM US! By using screens together, we can help show and teach them appropriate usage, and hopefully the fact that screens are helpful and useful… but that our lives don’t have to revolve around our screens. I personally feel like these 3 guidlines are totally doable for most families — definitely not way over-the-top, and they still keep it fun and light-hearted. Of course, they won’t work for every family or every child, but they are a start! Oh, and for anyone interested, I’ve found the websites listed below to be quite helpful and informative for parents of all-aged children. I’d love to hear your thoughts too… especially if you have older children. 12 Years Later... We Still Prefer At-Home Dates! We use a screen time app where we can set time limits and block cetrtain web pages. It just kicks my kid out when the time is up. We have other similar limits, no tablet when friends are over, at restaurants, etc. but we don’t care if she’s on tablet the entire time during a long car ride. Since she’s doing well in school, also plays outside a lot, is on a swim team and softball team, we don’t freak out if she’s on screens. I actually have found that I have more of an issue with grandmothers and the iphones, ipads, tablets…when they are around my kids. They seemingly can’t say no to the kids (if they ask to play games), are using them with the kids way too close to bedtime, and sometimes mindlessly scroll through Facebook and show my kids things that their friends are doing or sharing (which is fine in some sense, I just don’t like when they point out the number of “likes”.) I find myself sometimes trying to gently remind them of rules. honestly, I 100% agree with this! Great post as always! 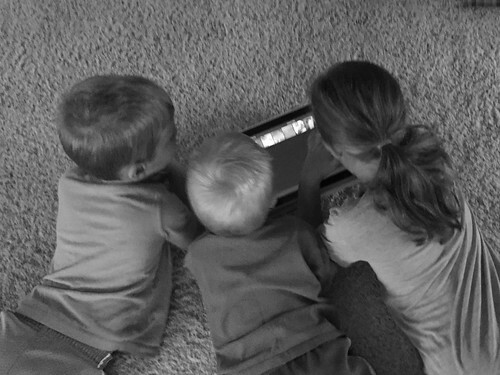 My only comment about your simple rules is that as they get older you will find that playdates are spent more and more with each kid playing in their own ipad, but usually the same game since they are connected online. It amazes me how much they can chat with each either while playing on their own devices. You would think that they are not interacting but it is the other way round, they do not stop talking, about the game, yes, but that is a lot of what their conversations are about even when they are not playing with an electronic device anyways. I read somewhere (can’t remember where!) that we shouldn’t refer to screen time (in that we don’t talk about food time/outside time/book time/sports time etc) but need to realise that screens are part of life and just work out how to integrate them into our everyday lives now. Especially as they are expected to do homework etc on them from quite a young age. So with that in mind I’ve just been trying to think about ‘balance’ …similar to moderation. Yes my children use screens and watch TV and yes I use it as a babysitter sometimes! But I always try to make sure there is balance in their day….like today we have had a whole day outside playing and gardening including picnic lunch and snacks. At 4pm we came in and I suggested they watch something while I sort the dinner. We don’t have any daily rules as such …I just try to balance everything they have done. I hope I’m teaching them a bit about balance as well and trying not to make a huge deal out of screens so it isn’t a big deal. This is great advice — thanks so much Jo! This comes from one of those with older kids. Mine are grown now, so TV was really the only screen we had to worry about. I did the same thing with balance. We played outside, visited friends, read books etc., and I never felt bad about some limited TV time. Huh. I would argue that a lot of the historic concerns listed in that post actually came true, although maybe not to the doom and gloom levels they were originally worried about and with some beneficial trade offs. But this is the world we live in now, so I do allow my children (of similar ages as yours) screen time for similar reasons. We have actually cut way back on screen time quite accidentally when I started letting the two older kids listen to audio books during quiet time. (They no longer sleep, but I do!) They will listen to Mr. Popper’s Penguins or Ramona Quimby for simply hours if I let them! And their attitudes afterwards are much better imo. I think that’s a great alternative. all that to say… my 13 year old has a phone… he can text like 4 friends on it… he can text me… he can watch youtube videos in moderation and he listens to music on it and play approved games…He does not have any social media… we teach him the etiquette that if someone is talking to you face to face– YOU PUT YOUR PHONE DOWN! we don’t allow phones in bedrooms or at the dinner table… they are not allowed to use them during the school day…and my son’s phone has Covenant Eyes on it, so he can’t use search engines on his phone at all… and it can be a “tool” when he isn’t meeting his responsibilities because its the first thing to go! yes, I’m enjoying the young child stage for now — so much more to ‘worry’ about once they get older! Now, my biggest issues are if they are sleeping through the night, eating enough, and happy! You can’t watch them too closely with electronics in my opinion. The amount of time spent with electronics in our house is less important than the quality of shows/games/literature etc. Our personal devices all have passwords to prevent the kids getting online without supervision. We have to change them occasionally because the kids are smart enough to figure out what the password is. They aren’t criminals, just curious and smart. Our Netflix has kids accounts set up to help avoid mature shows. Occasionally my daughter chooses a show where I don’t think it’s a good influence on her or my son and ask her to choose something else. She has intuition and a conscience and this helps her refine in her mind what’s ok and what’s not and we rarely have to discuss what’s the issue because she can tell. Hopefully it models how to switch gears when she is older and her friends are interested in something inappropriate. It’s been slightly more difficult with my son who is more imaginative and gets more interested in certain storylines. With him we just turn it off and talk about issues. He tends to argue or run wild with the what if’s so at his younger age just turning it off is the right thing to do. I have friends who can’t let their young children have screen time because it messes with their behavior so I do realize all children are individuals and this is what seems to work atthis stage with my kids. Wedont do much video gaming yet. My son plays Mario on the phone with my husband while they are waiting in public on occasion. Both kids play wii occasionally but usually just bowling and they tire of it quickly. I do get the sense that gaming can become a bigger deal in some families and for now I’m happy to put it off. My daughter has a kindle with parental controls. We have to check it occasionally for how she is using it and update passwords. This has been a harder device for us than the others. She has access to some YouTube videos that have inspired her to try to make her own. So cute and something to encourage within very close boundaries and to be aware of the social influence. We have not allowed her to post any, for now it is just pretend. The main way we protect our kids outside of passwords is to talk with them about all the issues. We talk about what’s ok and what’s not ok to do, why chat rooms aren’t ok, that we don’t know who is chatting so we shouldn’t believe they are who they say they are, that if anything feels funny or scary they will not get in trouble and can come to us with any question at any time, etc. I recommend this book to keep on a shelf for a child’s resource Good Pictures Bad Pictures by Kristen A Jenson and Gail Poyner. They have one for toddlers too but I don’t have that one. Thanks for all this information Michelle! So much good stuff for me (and others) to think about! Great post! What is the name of the reading app that was suggested by Nora’s teacher? Do you use any other educational apps that you would recommend? Thank you! Other than that, our kids don’t really use any Apps! The Paleo Mom has a PhD in medical biophysics, which actually proves your point better 🙂 A PhD is the process of doing research. Thanks for the link – I’ll read that tonight! Great post. Things do get trickier as your children get older. There are games my 11 year old wants to play, and we believe would be appropriate for him, but not for our 8 and 3 year old. It isn’t fair for him that his siblings are the reason why he can’t play them, but I don’t have a better solution. He and the 8 year old have pretty much the same bedtime, so it’s not like he can play a certain game after his brother goes to bed. I’ll take any advice on this subject from other readers. Also, our oldest son has friends whose parents let them play Call of Duty and other violent first person shooter games. This is crazy to me, and I think parents just give in because it’s easier than saying no all of the time. There needs to be a support group for parents like my husband and I who are sticking by our principles and the player age recommendations put out by the game companies! We started allowing our middle child, who is now 8, to play iPad games that are child appropriate when he was 3 or 4 years old. When he was 6, we completely removed the iPad from our household. Many of those games are not “winnable” which plays psychological havoc on a competitive child. Even though he had very conservative limits on playing time, iPad games pretty much made him into a crazy person. It took about about 6 months of detox to get him back on track. He can play the Nintendo 3DS, PlayStation racing games, and Nintendo Wii games with no problems. I’m telling you, there is something addictive about iPad game apps. Yes, I’m SURE it will get trickier once they are older — I’m enjoying this little kiddo stage for now! Weekdays – no TV, period. My son may play on his Kindle for 30 minutes after school while I work as long as the report from his teacher indicates that he had a good day (he has an IEP, so he has to meet his IEP behavioral goals). He usually does this right away so he’s done by 4. Beginning at 5pm on Fridays – kids can watch YouTube/play Kindle while I make dinner. We all watch a family movie Friday night after dinner. 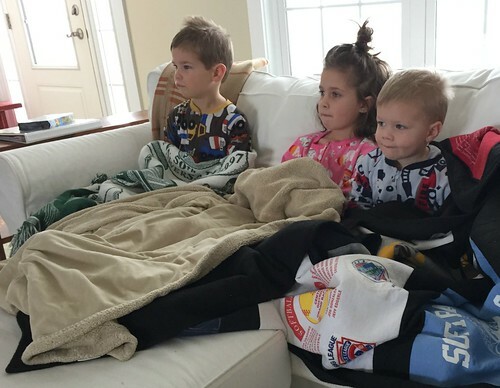 On Saturday and Sunday mornings they watch TV shows when they wake up until breakfast is ready. 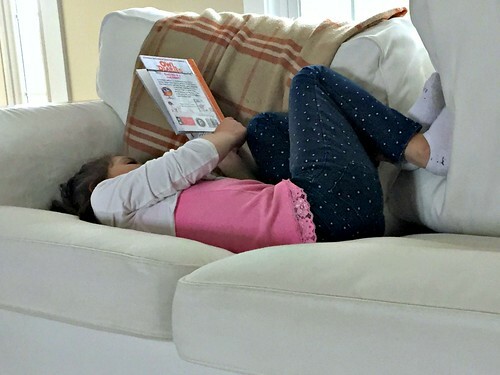 I set the timer on the Kindle for 2 hours and my son has those 2 hours each day – if he uses it all up before lunch, so be it, and I generally monitor my daughter’s time watching YouTube videos to about an hour or so. My son stays in our open great room and our computer is in the open as well so I can see what they are doing while I do my chores. 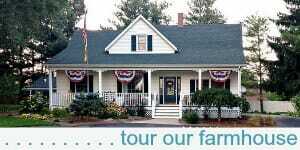 We may watch another movie as a family on Sunday afternoon depending on the weather. We do not get cable/satellite TV, but we do subscribe to Netflix & Amazon Prime, and the kids have their own profiles. The kids Kindle is a great tool and the parental controls allow a certain amount of independence while not allowing them out into the wild west of the web. Now that my son is reading more and more I plan on opening it up so that he can use it for his ebooks between 7am and 8pm unlimited, but only for the 2 hours on weekends for videos and games. Sounds like you have a good system — I think that’s the key right there too (especially when they are young). It doesn’t really mater WHAT your plan is, as long as you have a plan and a routine. 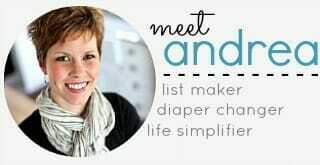 For example, my kids never even ask to watch TV after 4:00 because they know that once Nora is home from school, we play for a while, have dinner, do puzzles or more playing, take baths, read books, go to bed. It’s never a struggle or a battle because that’s always how it is and we almost never make any exception! Your kids know you never watch TV on the weekdays, so I’m guessing it’s not a huge struggle! We like to do the “Sketch” app. It’s sort of like Mr. POTATO Head. They get to pick the parts of the face and put them wherever. So funny! It also has other stickers you can add for free(dinosaur, etc.). That app was a huge help when we were waiting at the dentist!!! Your kids are about the same age as mine. They have been LOVING Would You Rather questions that I use with my online students. They like the questions with pictures. Now we even play in the car without the phone, too. They come up with their own, which can actually be hilarious! I have always appreciated your moderation viewpoint!!! And it has helped with guilt. Mom guilt can be the worst. Thank you for keeping it real! It helps this momma a lot!!! sounds like fun — we might have to check that app out. My kids love Mr. Potato Head! Also, Nora just got some “Would You Rather” books from her school library — the ARE fun! Oh, I’ll have to look for the books!! !